Longs Peak Family Practice is a Level 3 Patient-Centered Medical Home. The primary care medical home is accountable for meeting the large majority of each patient’s physical and mental health care needs, including prevention and wellness, acute care, and chronic care. We provide primary health care that is relationship-based with an orientation toward the whole person. Partnering with patients and their families requires understanding and respecting each patient’s unique needs, culture, values, and preferences. The medical home practice actively supports patients in learning to manage and organize their own care at the level the patient chooses. Recognizing that patients and families are core members of the care team, medical home practices ensure that they are fully informed partners in establishing care plans. We deliver accessible services with shorter waiting times for urgent needs, enhanced in-person hours, around-the-clock telephone or electronic access to a member of the care team, and alternative methods of communication such as email and telephone care. We coordinate care across all elements of the broader health care system, including specialty care, hospitals, home health care, and community services and supports. Our primary care medical home demonstrates a commitment to quality and quality improvement by ongoing engagement in activities such as using evidence-based medicine and clinical decision-support tools to guide shared decision making with patients and families, engaging in performance measurement and improvement, measuring and responding to patient experiences and patient satisfaction, and practicing population health management. Sharing robust quality and safety data and improvement activities publicly is also an important marker of a system-level commitment to quality. 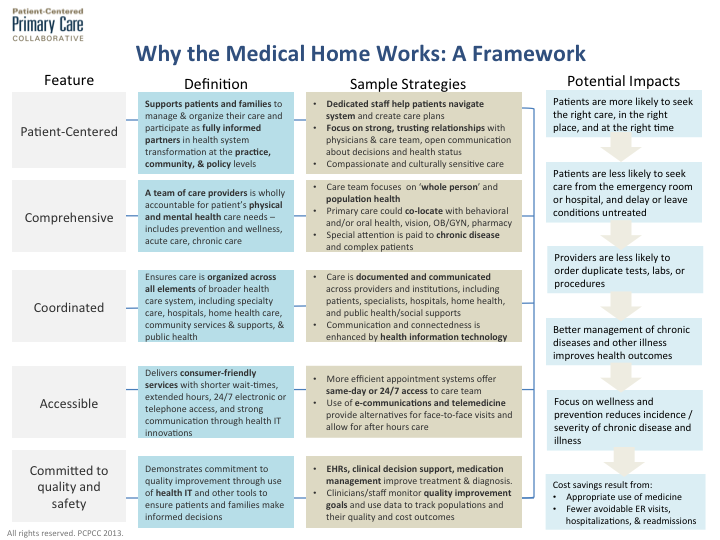 Read about why Patient-Centered Medical Home works. *Clinic subject to early closure based on scheduling.